The Adventures & Travels of RoadAbode: Skunk! Am took Molly out for her last "outing" for the evening, and out front of RoadAbode, saw a "cat" scurry across the street in front of her and Molly. Heard the neighbors dog give chase across their site in the darkness. Am continued up the street and then circled back. Found out from the neighbor it wasn't a cat. 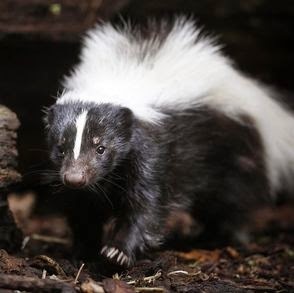 Their dog got a good shot from a skunk - and you could smell it in the neighborhood too. Shook Am up a bit, was almost her or Molly!